I’m a Radio 4 devotee – maybe even an addict. I need my fix of BBC Radio 4 every day and I almost always get it. I’m usually awake long before Farming Today but tend to be having my most productive part of the day while the annoying farming programme is broadcast so I try to switch on the radio for the Tweet of the Day and then, six days a week, the Today programme (greatly improved without Sarah Montague but now with the wonderful Martha Kearney). I dip in and out during the morning but often arrange my lunch to allow me to listen to The World at One (despite Sarah Montague) and then hope to get a fix of PM with Evan Davis at 5pm. I have my favourites dotted in between and later, and I often fall asleep listening to the World Tonight. Sundays are a bit of a shock to the system, as everything is different, but I try hard to tune in to Broadcasting House with Paddy O’Connell, even though he is a bit annoying (though not as irritating as Sarah Montague) at 9am. But Broadcasting House is patchy and a bit fey. Yesterday they played a bird song and listeners emailed in to tell them what it was. At least that’s what I think was going on as I made my way home from a walk around Stanwick Lakes (Dunlin was a good bird). The listeners were saying that the bird song was that of a Song Thrush, at least that’s what Paddy O’Connell said, whereas the song was, as plain as day, that of a Blackbird. I wasn’t shouting ‘Blackbird! Blackbird! Blackbird!’ at the car radio – honestly. But it got me thinking. 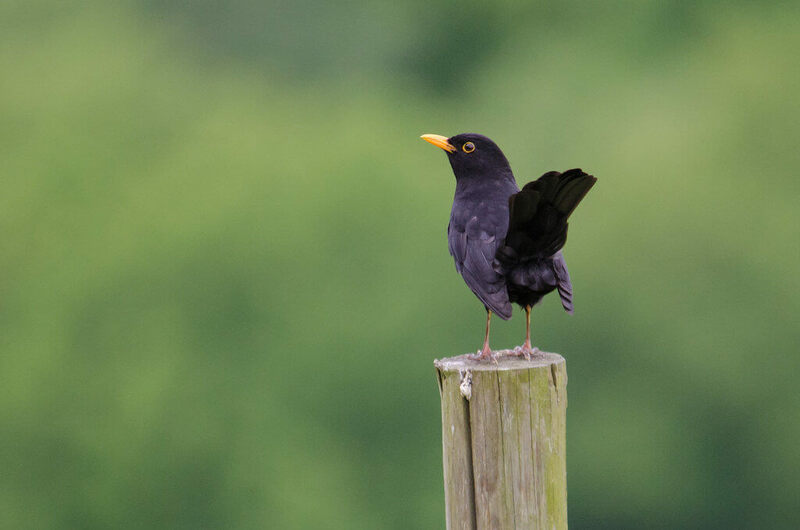 The Blackbird is a very common UK bird – one of our commonest, but perhaps more importantly one of our most widely distributed too. There will be few UK residents who don’t at least have the opportunity to hear a Blackbird sing every Spring day. I often hear several in the rural town where I live in the few seconds when I pick up milk bottles from the doorstep before most of the world is up and active. Hanging out or taking in the washing in the back garden will usually be serenaded by a Blackbird. And on my walk around Stanwick Lakes there were plenty of Blackbirds singing. And last week when I was in London I heard many Blackbirds sing – indeed I stopped for a few moments in a London park to listen to a Blackbird’s song above the city hum of traffic and people. But Radio 4 treat nature as a joke subject in the way that they do not treat other subjects. The sports coverage, even on Radio 4, rarely treats kicking a ball (of whatever shape) around as a matter of derision. Finance and the Stock Market are treated as important subjects that require no explanation because everyone will understand quantitative easing and the Living Wage. Literature is a serious subject where no-one would say ‘Oh my! I really don’t know my Hazlitt from my Hardy or my Heaney from my Hemingway’. But it’s almost as though an ignorance of nature is seen as a sign of sophistication and this comes through on the BBC. Jeremy Paxman will sneer at an undergraduate who misremembers or wildly and wrongly guesses the answer to a question about history or literature but will, without a blush, mispronounce the words in a science question and then be tender in correcting the wrong answers, or dramatically impressed by right answers, on any set of ridiculously easy natural history questions. To recognise a Blackbird’s song should be as much a test of cultural Britishness as knowing what Magna Carta was, the year of the battle of Hastings or who said that we would ‘fight them on the beaches’. But it isn’t. I am sorry to say I no longer regularly listen to BBC radio 4. The BBC presenters are grossly lacking in any scientific knowledge and, as you say, the natural world and wildlife issues are treated half jokingly. Usually the presenter is devoid of any ecological knowledge. The great majority of the channel deals with the arts, personalities and the media itself. I find this pretty boring. For those who have experienced a degree of filming of a subject or an interview, editing often totally distorts what has been said or biases it. The BBC should spend far less time hyping its programmes and hard selling itself and much more time presenting quality programmes as it used to do many years ago. I am sorry to say for me the BBC is a good case of “How are the mighty fallen”. Sort of half agree, Mark. But the problem is that testing for Britishness is rather un-British. In parallel to my occasional misidentification of bird song, it turns out I was a bit vague about the meaning of ‘fey’ – sort of half knew. But I do know for a full fact that lots and lots of non-birding Brits know and enjoy the song of the Blackbird. Murray - I’m more interested in testing for culture than Britishness really. Quite so. And why not test Blackbird culture too – the apparent increase in the number of individuals who like to embellish their songs by adding mimicries of ring-tones, alert beeps and any other repetitive electronic sound pervading the environment. Yes, Uni Challenge really makes me grind my teeth when students cannot answer the easiest of natural history questions. Same thing on the Chase, but in that case when the Chaser doesn't know! I agree so much. Having spent almost 5 years working from home, and many years before that with the schedule of radio 4 being the timetable to my morning, I have spent far too long just shouting at the radio over their science and nature coverage....However, there is good stuff out there, mostly on the world service schedules.... some of which I listen to when its broadcast in the middle of the night, other times on the listen-again facility. But, here is the big question - how does the UK, or maybe English, radio compare to that of other countries?... maybe its still streets ahead - I dont know. Listening to Radio 4 without applying knowledge of Chomsky and Herman's Propaganda Model filters would be a good habit to break.Is it really a surprise that a UK state mandated media outfit would not have much time for nature except in it's "lets allow space for things we can kill for fun" form. I do listen to it sometimes whilst driving but have to be aware of possible BBC induced road rage. Re. Farming Today, there was a good discussion on Saturday morning about Rewilding with Alasdair Driver (Rewilding Britain), a sheep farmer and someone from the Upland Alliance...well worth a listen IMO. the Springwatch series was good because Chris introduced some good science and facts into it which people are interested in. I'm afraid the blue planet Live left me a sleep with so little fact. The cameraman seem to be taught how to produce out of focus work and be carried away with the ability to produce close up pictures, which can be interesting but overview of say a leopard Hunt is often more interesting. Then there is the repeat use of the same clip of a butterfly or something if it's mentioned again. They say they are creating entertainment but unfortunately They are probably looking at viewing figures which includes a mass older generation who just want to fall asleep in front of the telly. I like Radio 4 too but the BBC has become too much of a ME ME ME MEdia Production. I must say I only occasionally listen to radio four, my usual station choices are Five live or sometimes Radio Two/ I do however watch University Challenge and sometimes Pointless ( not sure what that says about me!) yes the coverage of natural history and associated questions does make me cringe. When I was at grammar school back in the sixties without spelling it out the head and senior staff made it pretty clear that those of us with a scientific bent were somehow lesser beings, perhaps in some schools that is still the case. I find it incredulous that radio can get the song of the Blackbird or Song Thrush wrong but then as a life long naturalist my circle of friends, acquaintances and family are hardly unbiased. However a simple interest in what is around us should be enough to learn those to song patterns! Whatever happened to simple inquisitiveness? "But it’s almost as though an ignorance of nature is seen as a sign of sophistication and this comes through on the BBC. " It would perhaps be fairer to suggest that this attitude is pervasive amongst current affairs presenters. A significant a strand of the BBC's overall output and one which has made a huge contribution to its international reputation and its earnings is its wildlife programming. Programmes such as Springwatch, the various Attenborough documentary series and George McGavin's various explorations of remote and wild places do not treat nature as a joke subject but as one that is of great interest and importance to a large audience. I agree that recognising the song of the blackbird is something that we ought to be able to expect every British person to do. I don't mean this in the sense that identifying bird song is one of the hoops that aspirant citizens should have to jump through before the Home Office lets them stay here, Murray, but rather that it should be as fundamental a part of our education as the 'three Rs'. A natural history GCSE is probably not the way to achieve that as it will catch children too late and as (in all likelihood) an optional subject it will catch only those students who already have an interest in and awareness of nature. Rather, a part of every child's primary school experience should involve developing familiarity with common plant and animal species in their environment. I'm pleased to see others have noted the egregious pismronunciations employed by Pacman on Universally Challenged. I thought it was just me. But then, I didn't study Latin or Greek - otherwise I would have been a High Court Judge, obviously - so I have always used the pronunciations learned from mentors such as Frank H Brightman and A Hugh Bunting. But sneaky thoughts creep in - like perhaps Pacman is right - after all he does present as a bit of a scholar. It's part of the great obsession with all things human, instead of looking more broadly at the world. We are a selfish species. Some people talk of Species-ism I believe. Since Radio Caroline (the soundtrack to my day) started transmitting on Medium Wave from Orford Ness I've happily listened less and less to the BBC. As for Martha Kearney, very confident but (like many other presenters) far too quick to cut interviewees short when the conversation takes a turn she doesn't like. Totally agree. I find her interviewing very annoying and the interrupting and speaking over the interviewee exasperating. for broadcast no doubt to an appreciative audience. Trapit - do you know if the Ring Ousels are still in the same locality? When I worked for the YDNP doing bird surveys the head keeper on one estate, whom I already knew reasonably well asked that if I found a Ring ousel nest would I please tell him. He said he was not good at finding the nests but wished to photograph one. I did find one but it wasn't great for photographs, But I did tell him. Sadly he is no longer with us and modern keepers seem so much less knowledgeable or wildlife friendly. Two of his three under keepers knew a thing or two as well. Mind you they worked on a grouse moor where persecution would have got them the sack instantly. Changing the subject did anyone see Countryfile last night? They talked about minimum till as if it was new, I knew farmers nearly 20 years ago who used it for all non-root crops. They talk about anything as if it were new. Like - laying a hedge. But did they ask to Have a Go? Pacman once spilled the beans about Newsnight - all the producers are about 13, so if CF is similar they would not have been alive when no-till/min-till/CA got going. Ronksley moor, in the Dark Peak, yes they are still there . I suspect that it’s often because the presenters have to squeeze a quart of interview time into a pint pot; with the editor nagging in their ear about the must-not-be-held-up weather/thought for the day/pre-booked international call/“pips”. David - or the totally annoying advert for a future BBC radio programme. A bit off the subject but great to see Bob W’s reference to Radio Caroline on 648kHz AM in eastern East Anglia (plug!). Never thought to see Europe’s first - and continuing - all-day “contemporary beat combo” album station referenced on this august social medium... Now licensed by Ofcom, and using former standby aerial mast for (closed) BBC World Service MW to Europe. Also available worldwide via the web, and in some UK cities on local DAB channels (yeah, trying for a second plug!). The best radio programme in the world is From Our Own Correspondent, hosted by the superb Kate Adie. Wildlife isn't something adults are interested in though is it? It's something for the kids. Don't believe me? When was the last time you saw a wildlife segment on the news or the abysmal Countryfile where there weren't school kids pond dipping or something? In the publics mind wildlife is seen as a kids activity. It needs to be treated seriously to be taken seriously. I have been an avid R4 listener for 40 years and love it just as much as I always have. I disagree with much of the above comment and like the arts, culture and viewpoint progs more than ever. The Today Programme isn't the political rottweiler it once was but Martha Kearney us a great addition and asks the questions I want answered and pushes her points well. Costing The Earth is a serious environmental prog and what other channel in the world would play Tweet Of The Day? It is bird song with comments on personal experiences with birds. I have lived in other English speaking Countries and can tell you that in my experience the BBC is unique, a National Treasure that we take for granted at our peril. If it is gradually privatised we will loose it for ever. Radio 3 and of course the World Service have some outstanding content also eg. Outlook, Arts and Ideas and World Book Club.